This will be so superepic for us! Please remember the 15th of July for your payment to take part in Jar's Beginner's class in Paris. After the 15th we will check back if there are any free spots left and will fill up with the waiting list. If there is still some space left after this we will make another announcement to maybe find someone who still might be happy to be with us during this weekend. My name is Alex, and I have been a hobbyist just like you for quite a few years. I’ve been following your blog for almost a year now, and every time I seem to learn something new and exciting. Thus, I am writing to you, wondering if you could assist me in presenting the hobby in a new way. 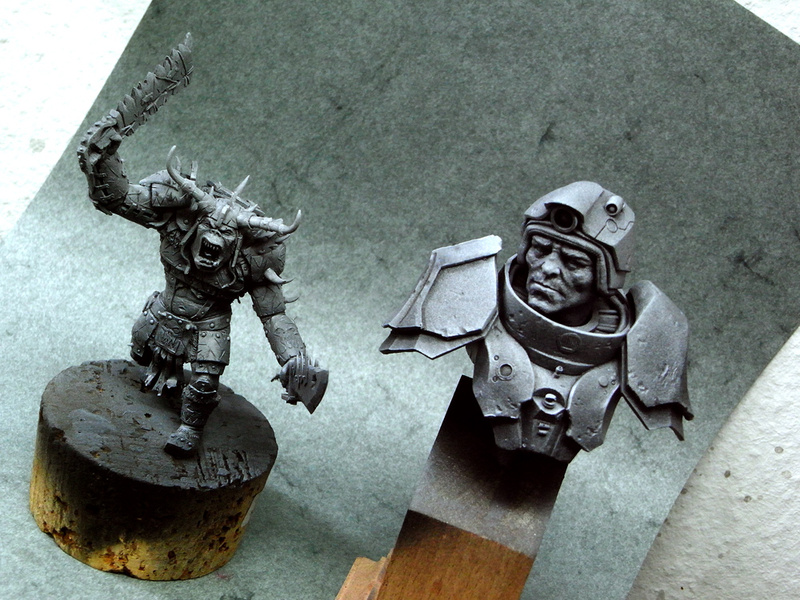 In general, I wonder how different people look at their work with miniatures (sculpting, converting, painting, etc.). As part of a small study I am doing (for a graded academic paper), I now have a chance to satisfy my curiosity. And since you dedicate so much time to the hobby, I hope you can provide some of your own personal insight by answering a number of questions. Thanks to you I might be able to talk about the hobby in a university setting. I am sending this email to all of you who write on Massive Voodoo, since all of you contribute so much to it. The list of questions follows bellow, and shouldn't take too long to finish. Please try to answer as many of the questions as possible and expand where you feel comfortable doing so. I highly appreciate you giving some of your time to help me out. Also - please try not to involve other Massive Voodoo members in your own personal answer, as I would like to know what you personally think." 1. 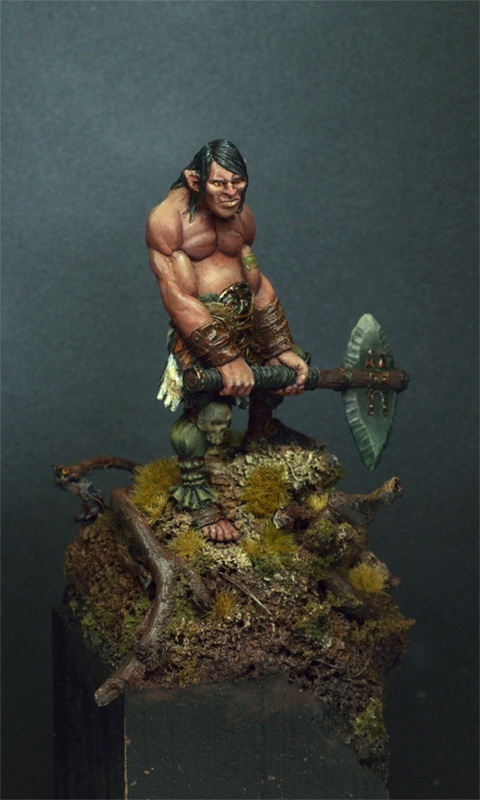 Do you paint or sculpt miniatures (or both)? Do you do only this? I for my part do only painting at the moment. I did some sculpt test runs and was pretty happy with the results. I have the plan to learn it someday but therefore I need more time and more space :) On some projects I do minor sculpting conversions, but that's it for the moment. 2. Do you compete (or want to compete) with your work? Why (if relevant)? Sure I enter a competition once a while but I am not after the prizes or the fame. Fame is just a big air bubble in this miniature scene. I am happy if I win something, but not unhappy if I don't. When I paint I don't think about competition or compete with other painters. 3. What led you to the hobby? My grandpa - may he rest in peace - did build a lot of plane military models and when I was a little boy I was totally fascinated by this time consuming but very satisfying use of time. Someday I gave him a birthday gift. A german Tornado in 1:35 and he was like, yes, that is now better than mine :D Some time spent without modelling and later on I walked in a local store that sold Warhammer Figures. That's the story. 4. 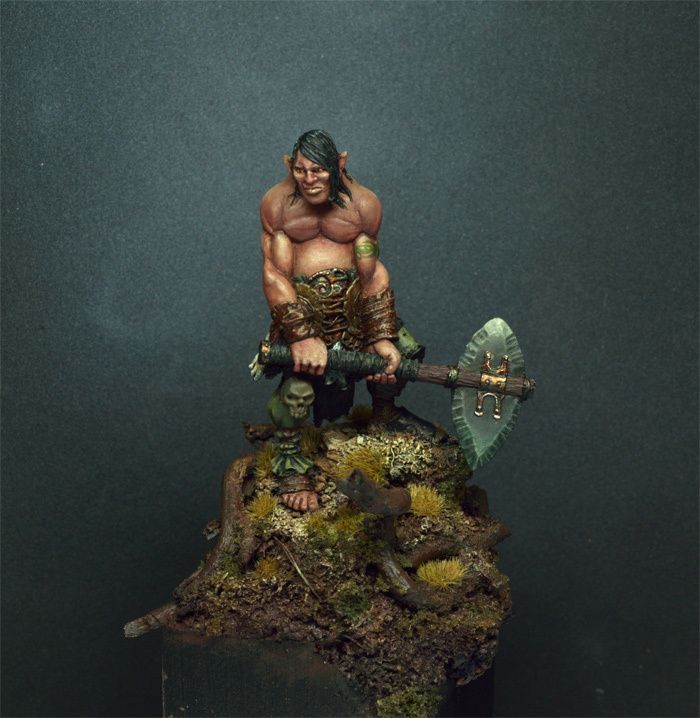 What do you like about working on miniatures? My inner Freedom and my inner joy and my inner satisfaction when working with colours. I like to tell stories with figures sometimes. Some personal straight from my soul and some very clear like a duel from ancient greek heros. 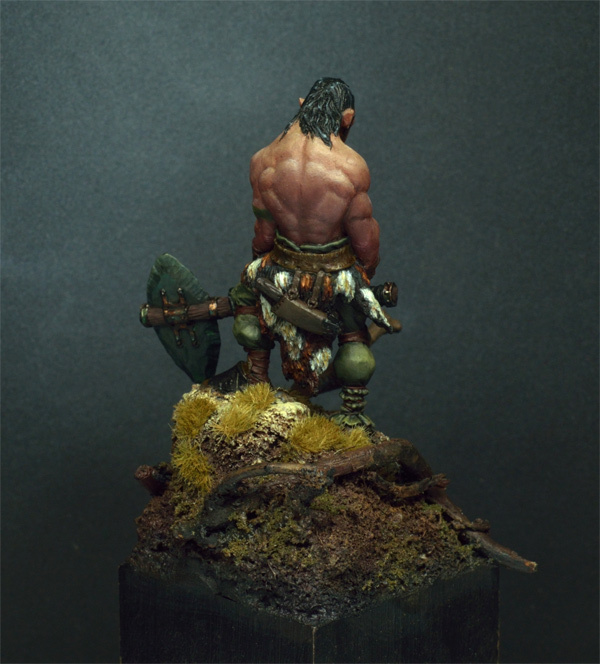 For me painting on miniatures is like painting on canvas, nothing more, nothing less. a. Which tools you would consider necessary and why? Basicly you need a stone, a brush and some dirt to paint something. It is the same with miniatures. In the end you need a figure, colours and a brush. But honestly you can also paint with your fingers instead of a brush if the figure is large enough. 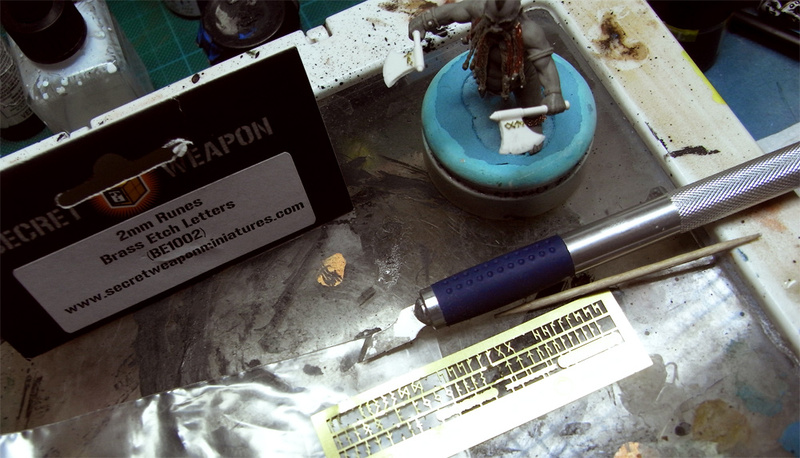 Additional you have a lot of tools for cleaning, preparing and basing but truely necessary are those mentioned above. b. What your work environment is like. Well, that depends on how busy I am and how the muse is active. Sometimes I work on a pretty tidy place, sometimes when I am away in my own fantasy worlds I forget about everything and work in a deep jungle of myself. I used to work at home in a extra room but soon I am moving into a bigger studio away from home, where I finally have to use the bycicle again to get there. c. How you choose what to work on and what you do with it. d. How often and for how long you work on a piece. Depends. Bigger projects take more time, small projects are fast, epic projects need their time, no specification here. I think the biggest time amount spent by me on one single figure was ~200 h so far and I really was mad with the project. I do paint everyday on different pieces. e. What you do with a piece, once it is finished. Most of the time I see my work as boring after it is done. As I am a freelance artist making a living from miniature painting I have to sell mostly all of my stuff. Some, I want to keep but I am always bored from my own finished stuff in my cabinet so I give them away as gifts to very good friends. 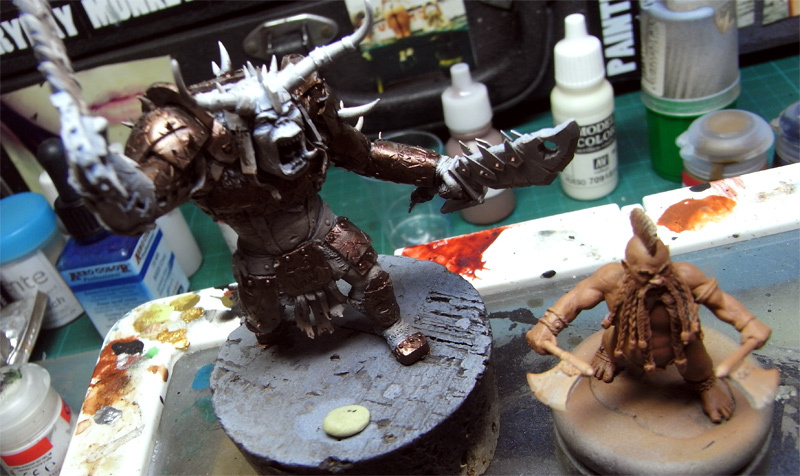 I enjoy the figure the most during the painting process. 6. What would, in your opinion, be considered a good miniature? Mmh ... from my point of view I would say a good miniature is a miniature where you can see that the painter had fun and enjoyed his painting very much. Also I like to see that the painter improved from his last miniature, that is progress and there can be progress already if you look in just one figure. For me a good miniature does not directly work hand in hand with techniqual perfection. Technichal perfection comes from years and years of training. So if you would say so, a newbie painter never paints a good figure and that is wrong from my point of view. 7. 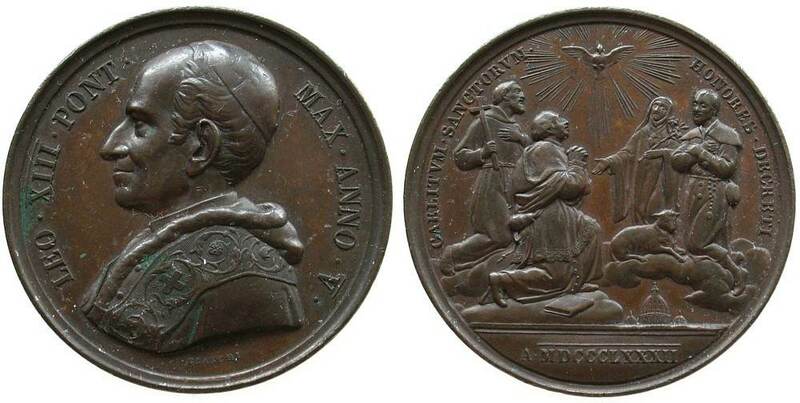 What qualities would an individual need, to be able to make such a miniature? His heart and brain, Joy - no matter the project looks in the end in techniqual aspects, the will to train and paint, paint, paint, paint and paint to learn from painting and the way of the colour. 8. Do you think anyone can reach a high standard? Explain your opinion. Sure. A high standard can be reached by everyone due hard trainging. In the end talent and ideas makes the difference between a hard trained figure painter and the ones who stand out even more. 9. Do you think money is important for the hobby? Please explain your opinion. For me as this is my daily job and my hobby - a dangerous mix, believe me - money is important to stay alive, yes.. On the other hand when doing the hobby just for the fun money is also relevant for example when you buy your equipment, from tools to miniatures, you will fast see it won't be the cheapest hobby. 10. Why work with miniatures? Do you prefer them over other artistic forms such as canvas painting or photography? I did a lot of canvas painting when I was younger. I now find myself enjoying the same spirit and mood when painting a figure. Just a canvas switch, but I will head for some bigger canvas in the future again when we arrived in our new studio. 11. 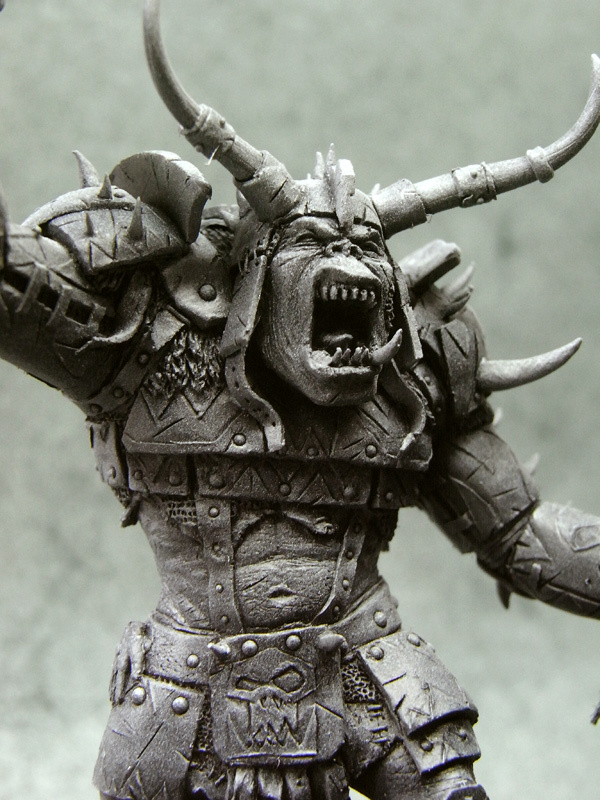 If you were to compare the painting (or sculpting) miniatures with other art forms, where would you say it’s similar and where does it stand apart? It similar in mostly everything in my eyes. Sure you have to split up in "Only painting display pieces" and "Painting Miniatures for Wargaming-Tables". The display thing has a high artistical potential when the figure(s) are use to transport a message or a feeling. Miniature Painting in all his aspects can be a complete study, a way of life where you learn to live in peace and harmony with your sorroundings if you have enough time to really study it. 12. 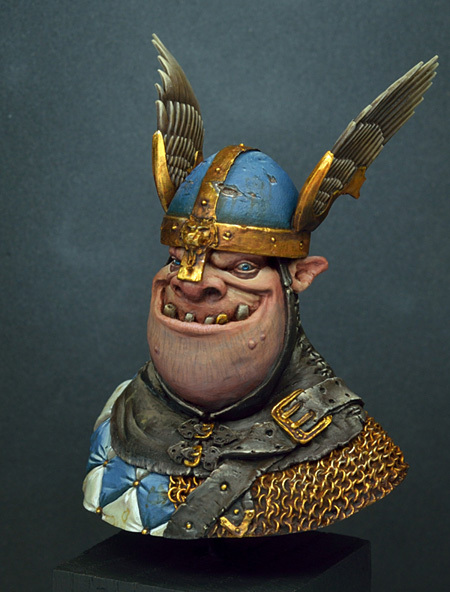 How do you deal with the fact that when painting, you are working on someone else’s sculpt? 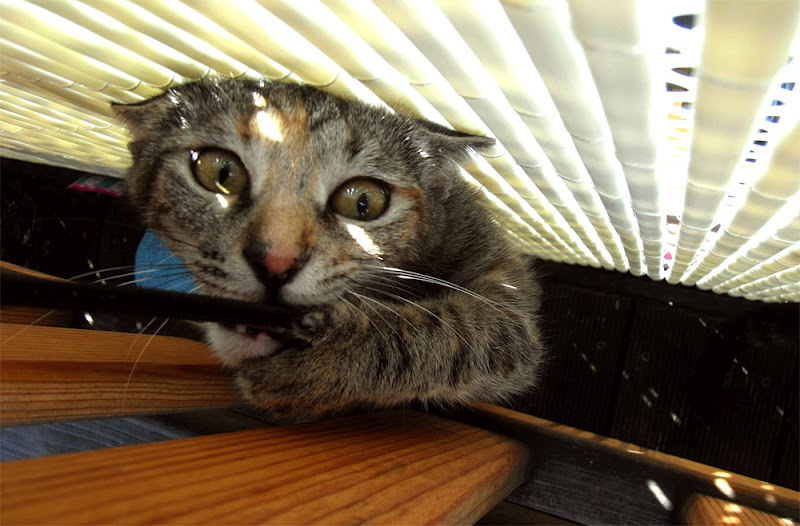 How does this influence your work process? I got no problem with that. For me it is more like an honor to be able to do so. No Influances beside the Honor-thing. 13. Is there a community of hobbyists where you live? 14. Are you involved with such a community (and if there is none, would you like there to be one)? Not really. We have a couple of friends we meet from time to time for painting but not special community plans. 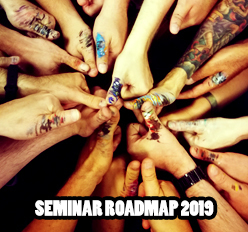 Sometimes we help to organize a painters meeting in our city or drive ourselves to another painter's meeting somewhere in Germany. 15. If you post pictures of your work on CMON, why do you do so? Yes I do. I do post my work there because I want to say thanks for all the inspiration I did recieve and still get from other painters. Also I sometimes post them there for linking them up to ebay. But in the end I really enjoy seeing my gallery grow up to 500 uploads, that is the main motivation at the moment. CMON is a great thing, but you got to take care of your emotions. I learned that over the years. If you are new to CMON all that matters is that kind of rating system and comments and so on. You soon can get dissapointed when you expect too much. Happened to me in the past too but I am cured of the dark side in my brain. Also you should think about the weight of the ratings. CMON offers the option to rate photos from miniatures. That's not miniature looking for me. I have learned over the years that nothing can compare to a miniature that you hold in your hands to look at it. 16. How do outsiders react to your work? Describe an event if you can. Often they think that little tiny soldiers are terrible nerdy kids stuff but in the end when they see the stuff in real they are mostly: ooooooOOOOOOOOOO!!! No particular event saved in my brain at the moment. I hope that is fine with you? 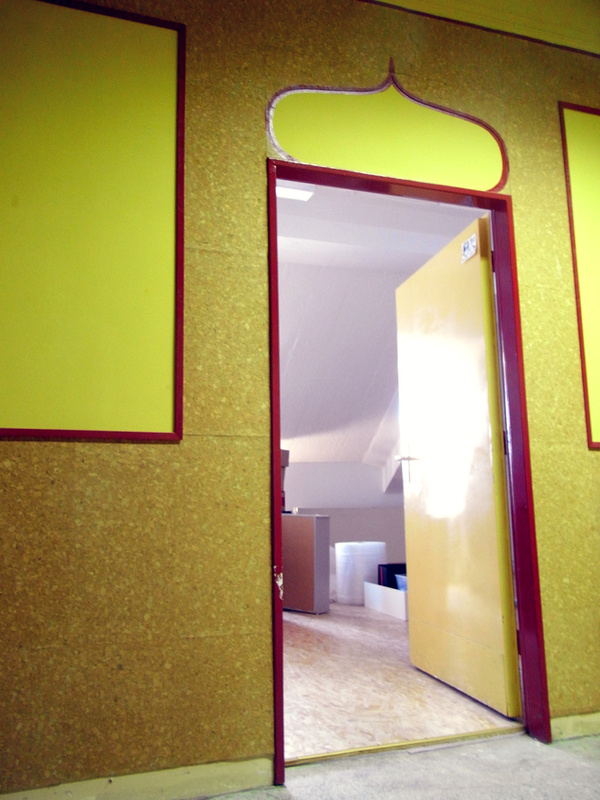 I am just so excited about moving into the Studio on next weeks Friday. Ahh ... it feels so well to be released from the dungeons of Diablo III. So well that I got some inspirational drop ins, coming straight out of the sky on a parachute, hitting triple jungle canopy and rushing through the brushes into your face ... enjoy! Enjooooooyyyyy and follow the sun! But anyway, there are two figures I finished lately, first is "Brekkus of Bavaria", proud knight of the bavarian beer-knight order. 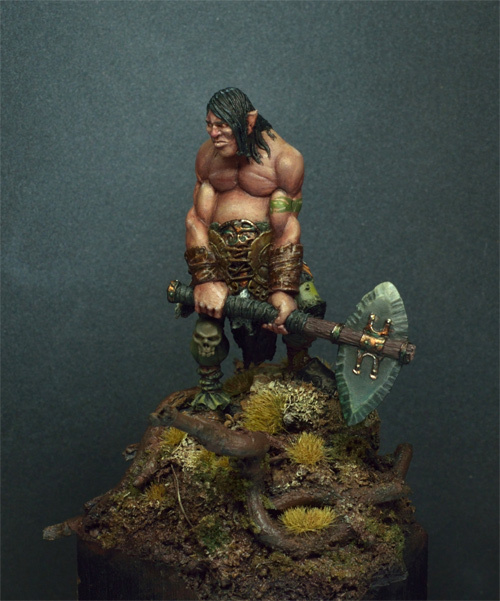 I painted this guy at the BÄM²! workshop as a demonstration object for different techniques etc. This big badboy is named Typhaggahw and is sold by Maelstrom Games. Sculpted by Roberto Chaudon and around 17cm high and 18 cm long it is really a big chunk of drivelling, snapping wyvern meat! 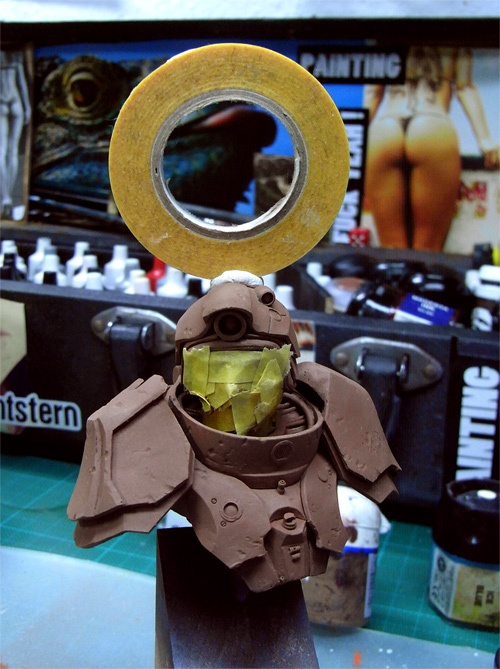 Yesterday night before I went to bed I was checking the upcoming eye position to find out what fits best for the bust. I did use a simple paint programm for that. I am very thankful to Thorsten as he wrote a little review on the private class which took place some weeks ago. There will be more news about private classes sooner or later in the jungle, when Raffa and I moved to the STUDIO!!!! I already met him once again after the private class as we had the BÄM² Painting class close to his home and we have been able to make final photos of the figure just straight out of that 2 days class as Thorsten did not paint on at the model ... but he promised to me, he'll finish it up! I for my part can say only gratitude to Thorsten for being such an A student during our time, thank you for having such true and honest days with just the two of us and some paint on brushes - It has been my pleasure, really! Many thanks also to Melanie, who made this all happen!! Deep Kong Fu bow to you both! followed up by Thorsten's impressions, me just quoting him! below you find an in depth-report of my Private Practice lessons with Roman down in the deepest Jungle of the Massive Voodoo Crew. If you get bored while reading just jump to the end to my final words. These are the most important! First of all let me introduce myself in a few short sentences. 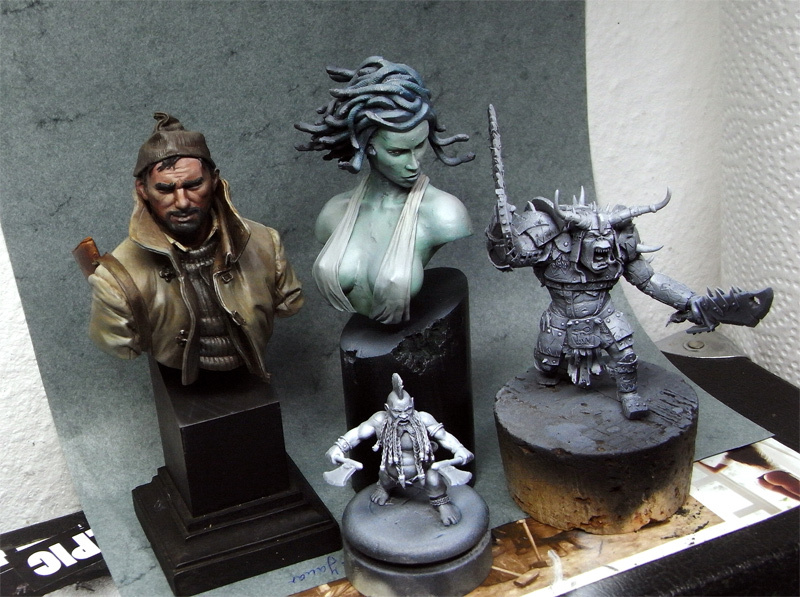 I´m Thorsten and 30 years old and started the miniature hobby round about 10 years ago. It all started with gaming and less painting but shifted more and more to the painting aspect during the years as it is just hell fun and satisfying to see a miniature come to life under your brush. The passion for the hobby was born but progress in painting skills came slow and on the hard way due to time shortness and absence of capability. A push into the right direction was necessary. Time past by and at the end of May the big day finally had come. The plan was to stay two days at Big Kongs lair and experience his massive painting aura and in my baggage was a voucher for several hours of direct, private, helpful and wise painting hints and instructions. Arriving at Roman´s flat we didn´t waste any time. Big Kong was keen to get the painting party on and started to beat the jungle drums with all his power. First a look into his cabinet, some oh´s and ah´s and questions from my side. The Rhino is really amazing and to see it in real life was awesome! 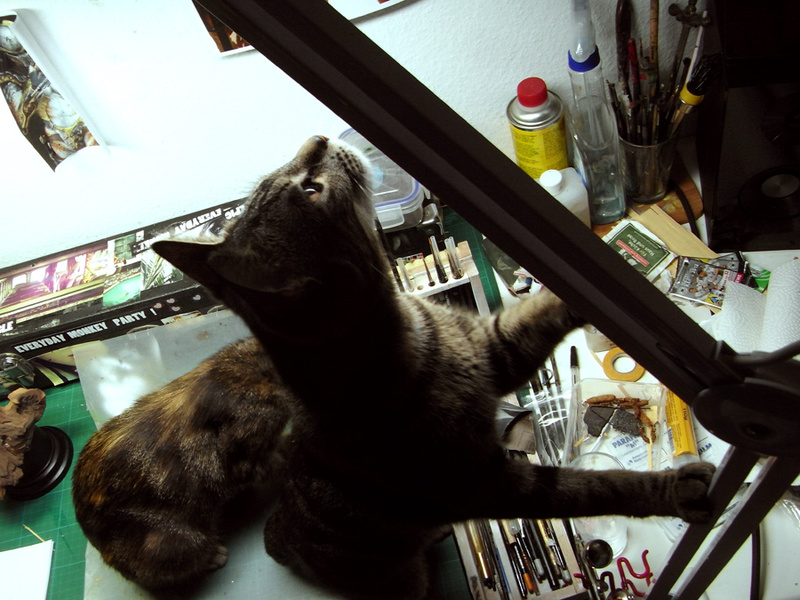 We headed straight to the painting table where everything was well prepared: Miniature and base, paints, a well cleaned airbrush ;), my own professional light, and everything else you can imagine. First step was a talk about my homework. I had to paint up a Brekk as best as I could. Roman had a in-depth look to my painted Brekk and gave me a lot of hints how to improve the overall look. Then he took his brush and started to do the first voodoo of the day and showed me how he would improve the skin tones. 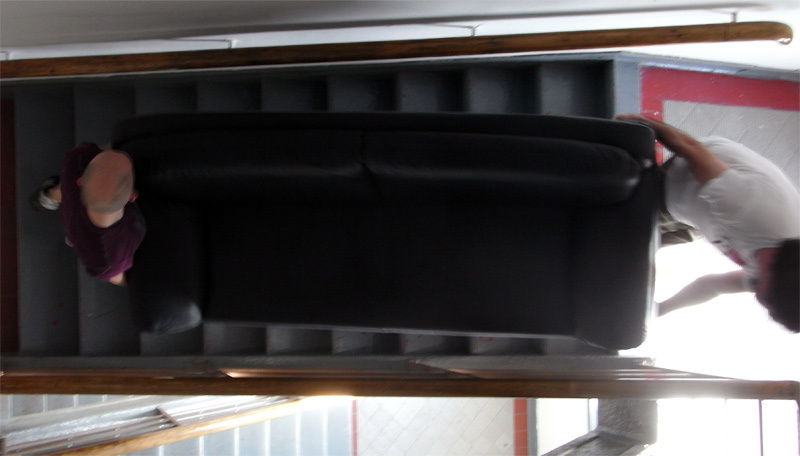 Basically it all comes down to light improvement, cleaning areas and increasing contrast. It is just eye opening to see someone do it instead of reading about how someone would do it. After preparation work we started with the skin. First "conditioning" (a really important word during this two days) of the skin areas. We used an airbrush to speed up the process and to ease our work. Thereafter we started with the Kong way of happy painting... making a draft of the light situation directly on the miniature using the wet in wet technique. Although I already knew this from the beginners class it was good to see it again. I always used to much water during this step what makes it more difficult and time consuming. Good to erase this mistake. Morning of the next day came quite fast but after a decent breakfast with coffee and pretzel I felt ready for the hours to come. 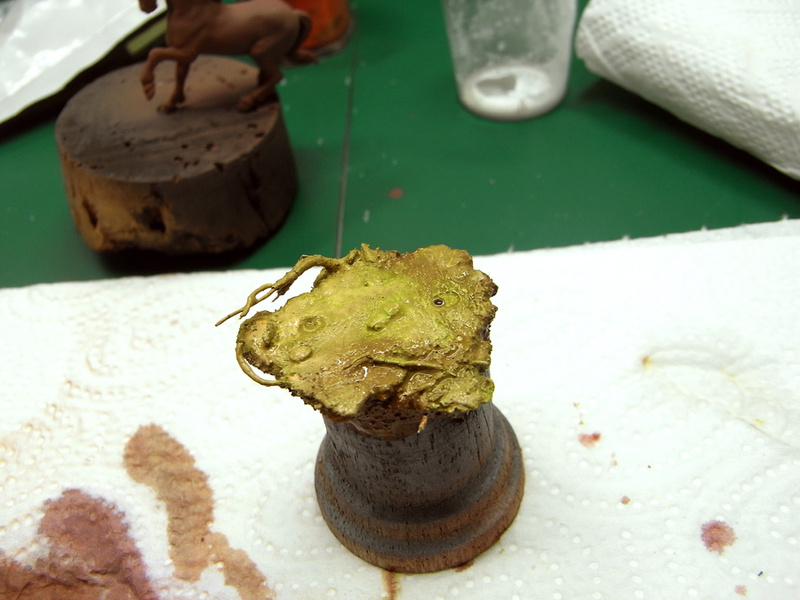 Next thing was to prepare the other parts of the miniature. Roman helped me to find a color scheme. The next few hours I was busy bringing paint to the leather parts, the trouser, the axe,... conditioning these areas and so on... less help was needed at this stage but nevertheless Big Kong was around me all the time, ready to answer my questions and to give me a helping hand. 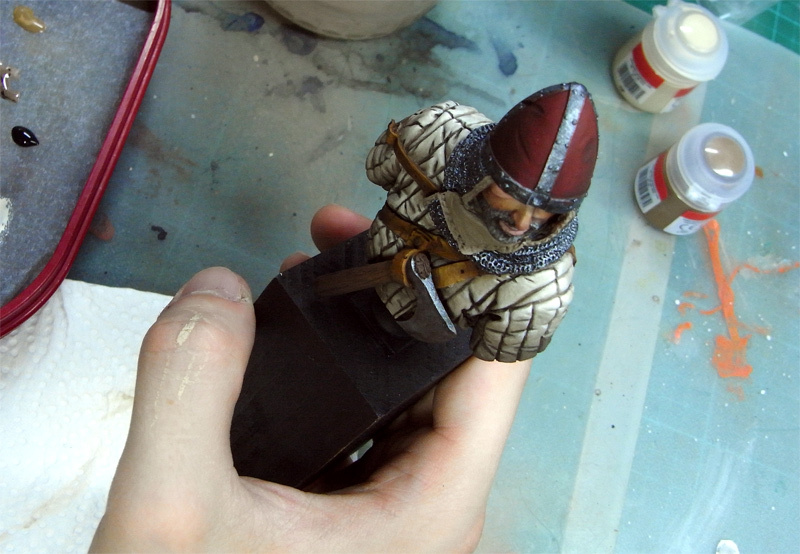 Around midday we started with some lessons on how to paint special textures (leather, cloth, stone, earth, metalls...) always brushes in hands and doing it directly on the miniature. So we spend a lot of hours and time just flew by. Brush stroke after brush stroke I worked on my miniature seeing it coming to life in my hands. I just forgot time and nearly fell asleep somewhere around 3.30 in the night. We started at 9.00 o´clock the next morning. Roman still full of energy to teach me some things and we made a final hour of power painting. He showed me how to bring some finishing touches to special areas so giving the miniature the final Wohoooo-look. This is my next homework: finish the miniature! I definitely will! Before I had to leave we made a short visit to Raffa and I had the opportunity to take a closer look at his cabinet. Really stunning! 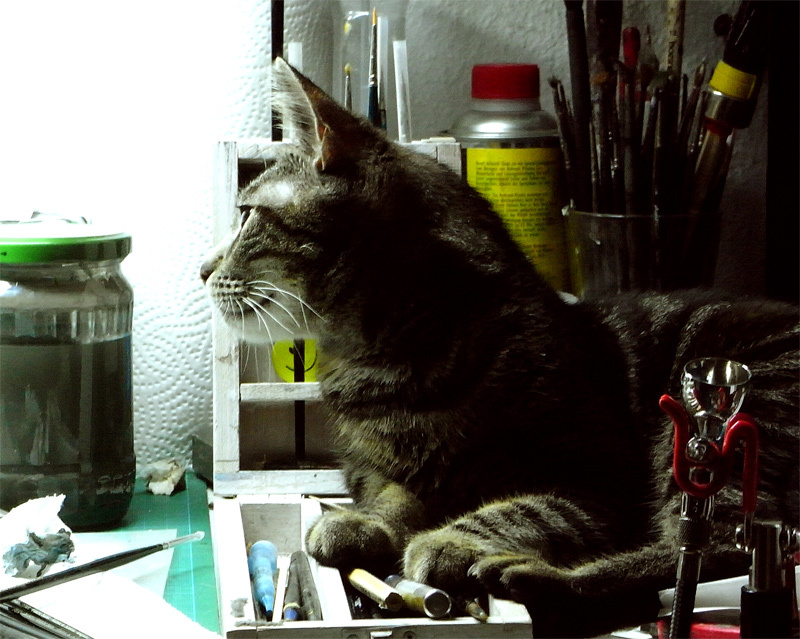 I also had the possibility to see him at work using 3 brushes to paint 2-3 miniatures (can´t remember) at a time! Couldn´t believe it! Roman told me before that he painted his Demon Prince by attaching the brush to his forehead and bonding his hands to his back. Thought it was a joke, but now I believe my friend! The both of them brought me back to Augsburg main station where I finished my Big-Kong-Experience. It was just great! Epic! Awesome! Massive! Thanks a lot for this great gift! You made it real and until the end I couldn´t really believe this to happen. It was just awesome. I love you! Roman, I owe you for the great time! It was really, really massive for me. You opened my eyes and gave me (again) the possibility to do some big steps forward in my painting skills. It's up to me know to complete it - as painting skills are like a muscle one has to train and train and train again. This, I also learned from you! To reach a level like yours (which I certainly never will) is just hard work. It might look easy but one has to be willing to invest a lot of hours. I want to say "Thank You" to you for your hospitality, your generosity ,your heartiness, the great chat we had during our painting experience, and everything I might forget now. I´m not exaggerating now and I mean every single word by heart. Everyone knowing me personally knows that I´m not easy at hand with such words but you are a great person and you deserve them! You and Raffa keep on the good work you are doing with Massive Voodoo. I believe that there are great things coming out of the jungle in the future! If there is ever the possibility for you to experience Roman at either a private practice (don´t know if he will do this again) or beginners or class or advanced class: Use it! Ende Mai war es dann soweit. Der Plan war es, zwei Tage in Big Kongs Lager zu verbringen und seine immense Malaura aufzusaugen und von ihm zu lernen. So ging die Reise los und im Gepäck hatte ich einen Gutschein über mehrere Stunden hilfreicher Malanleitung, Tipps und geheimen Tricks. Um 14.00 Uhr bin ich am Augsburger Hauptbahnhof. Wohooo... Zwei volle Tagen malen vor mir. Danke dafür schon mal, Roman. An der Wohnung angekommen, haben wir auch keine Zeit verloren. Big Kong wollte schnellstmöglich die Dschungelparty ins Rollen bringen und hat mit aller Macht die Dschungeltrommeln zum Klingen gebracht. Erstmal stand ein kurzer Besuch der Vitrinen an. Viele Oh's, Ah´s und Fragen von mir später (das Rhino ist der Hammer! ), haben wir uns auch direkt an den Maltisch begeben. Dort war schon alles vorbereitet: Eine fertig gebaste Miniatur (der Enigma Troll), Farben, eine wohlgesäuberte Airbrush (!!!) und anderes Malmaterial sowie eine professionelle Mallampe - nur für mich. Einfach perfekt vorbereitet. Als erstes ging es an meine Hausaufgabe (ich sollte einen Brekk so gut wie möglich bemalen). Roman warf einen kritischen Blich darauf, schnappte sich die Pinsel und demonstrierte mir am Objekt selber wie er die Haut verbessern würde. Es war wirklich sehr, sehr hilfreich zu sehen wie es jemand direkt umsetzt, anstatt nur darüber zu lesen. Theorie und Praxis halt.... Am Ende konzentriert sich alles auf Sauberkeit, Erhöhung des Kontrast und dem richtigen Setzen des Lichts. Dies war wahrscheinlich der beste Weg, um den Kurs zu starten. Big Kong war am Anfang etwas nervös (so wie ich auch! ), da ich sein erster Einzelschüler gewesen bin und er das Konzept ja zum ersten Mal getestet hat. Als nächstes haben wir uns direkt der Workshopminiatur zugewandt. Erstmal mussten ein paar Gussgrate beseitigt, Unebenheiten ausgebessert und die Figur grundiert werden. Schon bei diesen "einfachen", allseits bekannten Arbeiten, hagelte es eine Menge Tipps und Tricks und ich musste fleißig Stift und Papier zu Hilfe ziehen, damit diese wertvollen Infos nicht in den Unendlichkeiten meiner Hirnwindungen verschüttet gehen. Auf dieser Skizze aufbauend hat Roman mir gezeigt, wie und wo ich Licht und Schatten platzieren muss, wie ich aus der Skizze einen schönen Verlauf zaubere und die Haut somit Stück für Stück vitrinenreif mache. Hört sich einfach an, oder? War es aber nicht. Das war der wahrscheinlich härteste Teil des Workshops für mich. Es hat dann doch gedauert bis ich das umsetzen konnte. Roman stand mir aber immer mit Wort und Tat zur Seite und hat so verhindert, dass ich an einen Punkt der Verzweiflung geraten bin. Irgendwann zwischen 11.00 und 2.00 Uhr Nachts (ja, die Zeit verging im Flug) hatte ich dann meine persönliche Bäm² Erfahrung. Es hatte Klick gemacht und Dank Romans Lehrfähigkeiten, der tollen Skizzen und dem Vormalen war ich doch tatsächlich in der Lage, einen schönen Verlauf auf einzelne Muskelpartien zu pinseln. Etwas, was ich am Morgen des selben Tages nicht mal ansatzweise so toll geschafft hätte... Bis um 3.00 Uhr, als wir ins Bett sind, ist es mir tatsächlich gelungen, die Haut fertig zu stellen. Nach einer sehr kurzen Nacht graute schon der nächste Morgen. Dank eines ordentlichen Frühstücks mit Kaffee und Bretzeln war ich trotzdem für die nächsten Stunden, die da kommen sollten, gewappnet. Roman half mir, ein generelles Farbschema zu finden und die nächsten Stunden ging es erstmal ans Konditionieren von Flächen. Schön alles sauber bemalen und Farbe auftragen. An dieser Stelle war weniger Hilfe von Big Kong nötig, aber nichts desto trotz war er immer mit einer helfenden Hand und einem offenen Ohr direkt für mich zur Stelle. 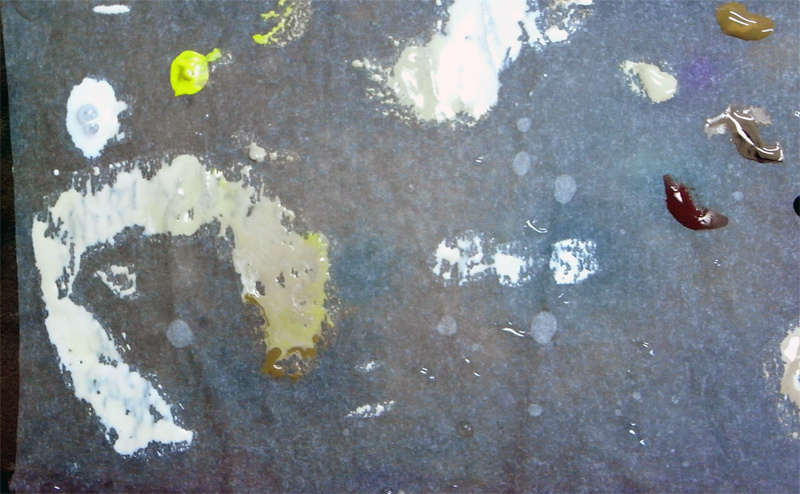 Nach dem Mittag ging es dann daran, zu lernen wie man verschiedene Texturen und Materialien bemalt (Leder, Stein, das Base, Metall, Stoffe....). Hier hat mir Roman viel gezeigt und vorgemacht und ich habe es nachgemalt. Die Zeit verflog und Pinselstrich für Pinselstrich erweckte ich die Figur in meinen Händen zum Leben. Um 3.30 ist mir der Kopf einfach auf den Maltisch gefallen (ok, so dramatisch war es doch nicht...) und wir sind zu Bett gegangen. Ein ordentliches Stück Arbeit war an der Figur geschafft. Morgens um 9.00 Uhr ging es weiter. Roman war immer noch voller Energie und wollte mir noch ein paar Sachen beibringen. So haben wir noch ca. 1 Stunde verschiedene Bereiche besprochen und er hat mir Sachen gezeigt, die ich jetzt zu hause an der Figur noch umsetzen muss und auch werde! Vielen Dank für dieses tolle Geschenk! Du hast dafür gesorgt, dass es real geworden ist und bis zum Schluss konnte ich nicht glauben, dass es passieren wird! Ich liebe dich! Roman, ich schulde dir was für die tolle Zeit! Es war einfach nur fantastisch! Du hast mir ein weiteres mal die Augen geöffnet und Möglichkeiten gezeigt, wie ich meine Malfähigkeiten ausbauen kann. Dies zu vollenden liegt nun an mir, da Malfähigkeiten wie ein Muskel sind, den man ständig trainieren muss. Auch dies habe ich von dir gelernt. Es sieht vieles sehr einfach und nach purem Spass aus, aber um ein Level zu erreichen, wie du es hast (und das werde ich bestimmt nie), bedarf es harter Arbeit! Ich möchte mich bedanken für deine Gastfreundschaft und Großzügigkeit, deine Herzlichkeit und die tollen Gespräche, die wir hatten und für alles was ich jetzt vergessen habe. Ich übertreibe hier nicht und jeder der mich genauer kennt, weiß, dass ich nicht schnell bei der Hand bin mit solchen Worten, aber, Roman, du hast sie dir mehr als verdient! Du und Raffa, haltet die gute Arbeit, die ihr mit Massive Voodoo macht, aufrecht. Ich bin der festen Überzeugung, dass in Zukunft noch tolle Sachen aus dem Dschungel kommen werden. Wenn ihr jemals die Möglichkeit habt, einen Workshop oder gar eine Privatstunde (keine Ahnung, ob Roman das noch mal wiederholt) mit Roman zu genießen, dann nutzt sie! Es wird eure Malfertigkeiten nach vorne bringen! Definitiv! Er ist ein toller Lehrer und kann euch immer helfen und geht auf eure individuellen Probleme und Fähigkeiten ein. 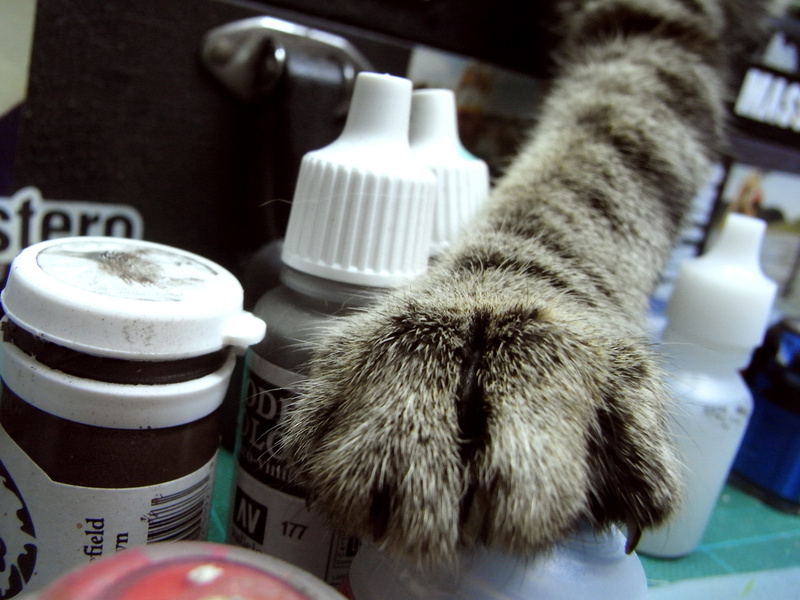 Jar's Beginners Painting class in Vienna, Austria!! Good news for this years Octobre. Vienna is not only one of the most beautiful cities I have ever been it is also home of one of my painting classes in Octobre 2012. Thanks to Michael and the gaming club of WOW/Keepers for helping organise this event. If you are interested in taking part in the class this link will bring you to further details. Class is held in german language. If you are interested in my first english class please check Paris for details. Make your brushes ready for some fresh wind - see you there! 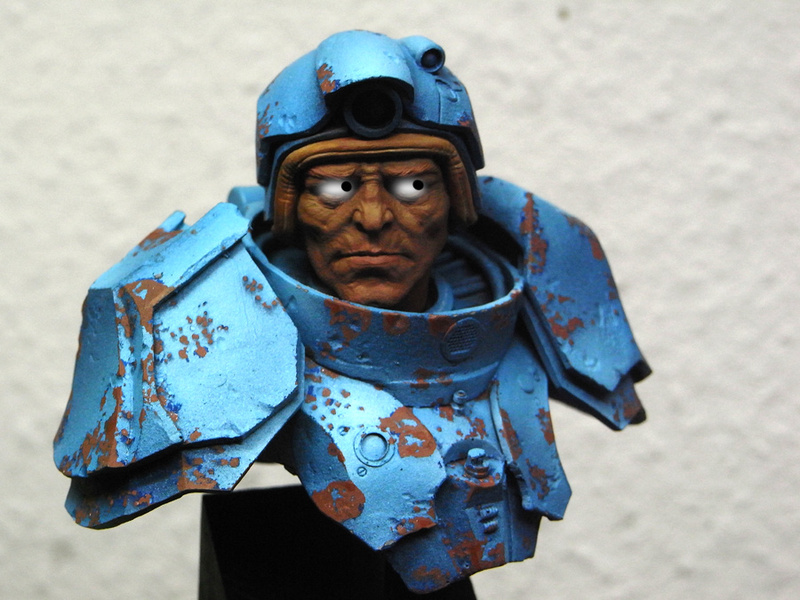 Some of you asked about this bust and I really can tell you, this is one of the best faces I ever had my brush on. 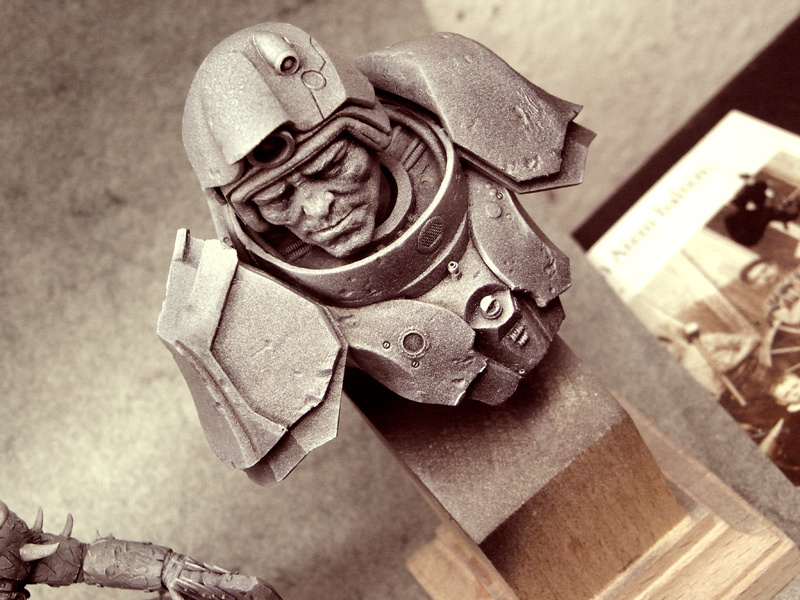 The bust is sculpted by Romain Van Den Bogaert and sold by Wonderlands Project. At the moment they are waiting for stock up on the busts as they have been already sold out. Make sure to know that you can win one of these in the upcoming biggest painting competition ever hold on MV - thanks to Wonderland-Projects. 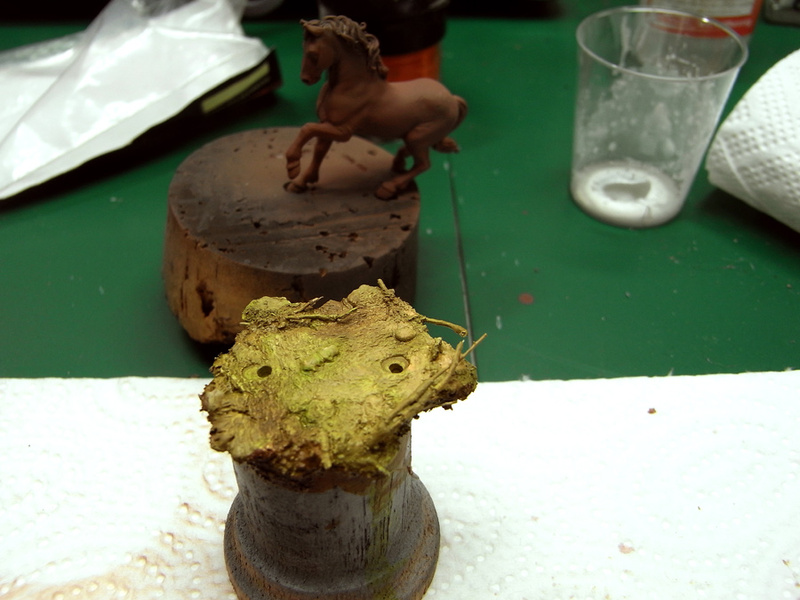 Peter was painting at his Normanic Bust from Young Miniatures and does some great progress. 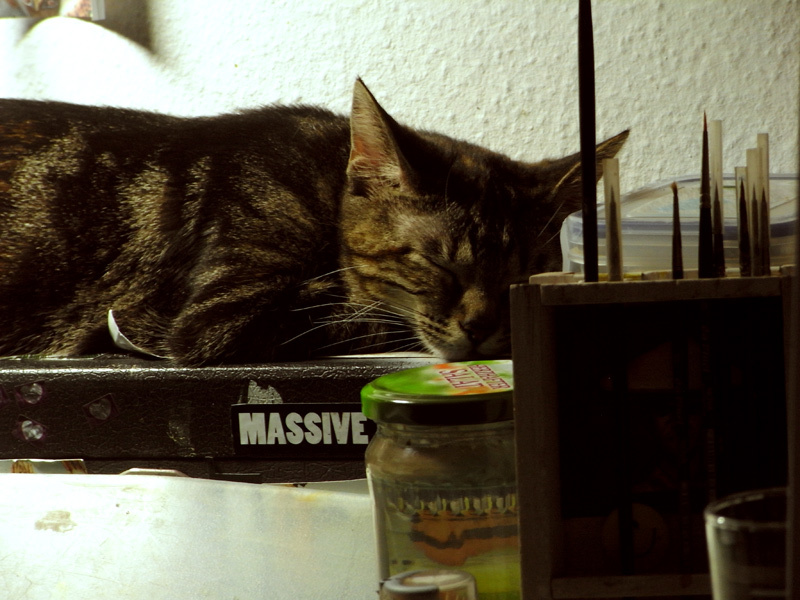 Started back in early 2011 I left her at Robert's in Graz as I did not want to see her again. She was somehow WIP but I did forget that I left her in Austria in Robert's cabinet. I found her this year in the same spot when I visited him and choose to take up with the figure again. It is nothing special, just a finished figure that had to be finished. ... but with the magic drink of "growing tall". In the end it turned out to be a couple that drank the magic drink of tallness. Now it is time to get back again to normal seize. The man drank without discussion but now as the lady sees her lover so tiny she feels power rising up in her. So she really is not sure if she wants to get back to normal seize again and he ... yes, he seems to be lost by being small alone ... magic drink, maybe not! for the magic drink, click here! But for me it was fighting with the shadows of the past and winning the fight. PS: This Figure is for sale - contact me via mail if you are interested! ... to finally find freedom again. I told you about uninstalling Diablo III - I stood strong for one day without it, but I've watched a thousand movies on that day, so I reinstalled and was happy to play again, simple as it is. I like the game, I like getting stronger with my Fist of Ytar, but in fact the game just steals my time. I am really happy to have Raffa living so close next to me as we both played the game together with Peter and often talked about stupid stuff like farming around for hours to buy horrible priced brandnew bracer or a helmet with totally great attributes that makes you 0.6 % stronger in your overall equipment and in the end you just die on Inferno. Jagganatah - that is the name of my character fought his way up to Act III on Inferno but I often felt like a little goblin with a knife fighting shermans. 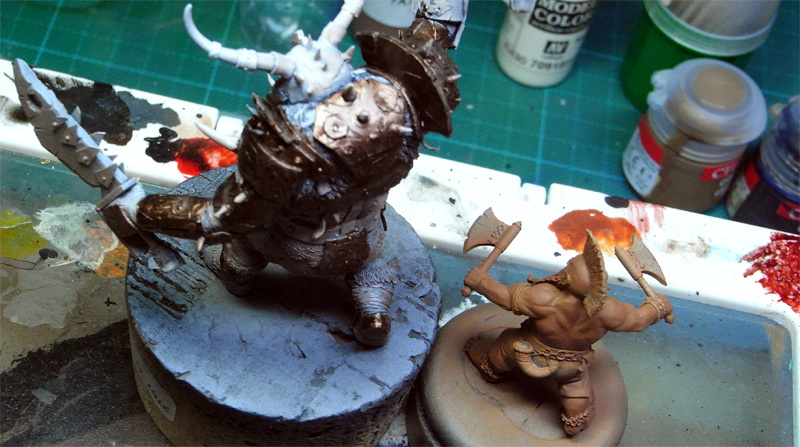 Yesterday night, during "painting and gaming" I just realized how stupid this game makes me, but I am still having fun. Today we had again a chat like real man, about the important things in life and questioned so many things. When playing on Inferno you will be a good player from your skills quick enough - if not you die a million deaths. Now only your equipment can make you a better character and it won't drop, you just farm and farm and farm to buy these glittering shiny earings with extra dexterity ... and yes 0.3% stronger ... let's farm some more and time is losing its meaning if you are sucked in what Blizzard has prepared - it really makes addicted and is bad, even it is a lot of fun in the end. Just giving Peter back his ultimate super ring he found and lent me and maybe he sells it in the real money auction house. As I love to paint again and maybe I will play another game on another day that makes me feel better after playing - when I am playing out for satisfaction and fun and not money farming to get 0.1% stronger or 8% better looking. Ahhhhhh ... I just realized at the Orc that there is a tooth missing. 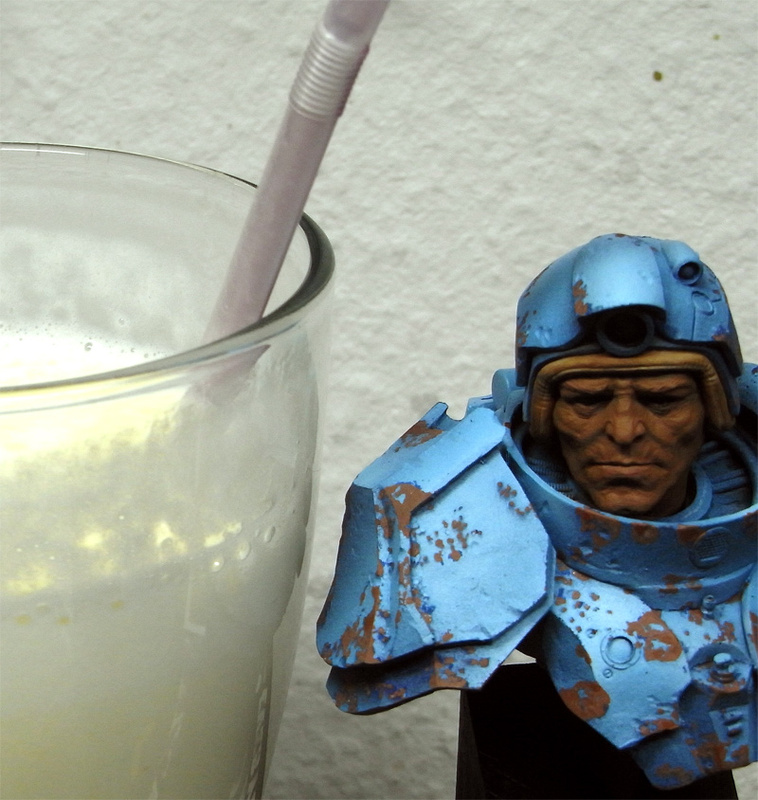 There was minor damage on the Orc, sculped by mati when it arrived here at my place. I repaired many but missed a tooth?? C'mon!! ... but not with happy painting! as the news of our upcoming studio really rocks my heart!!! Aloa on this sunny day! 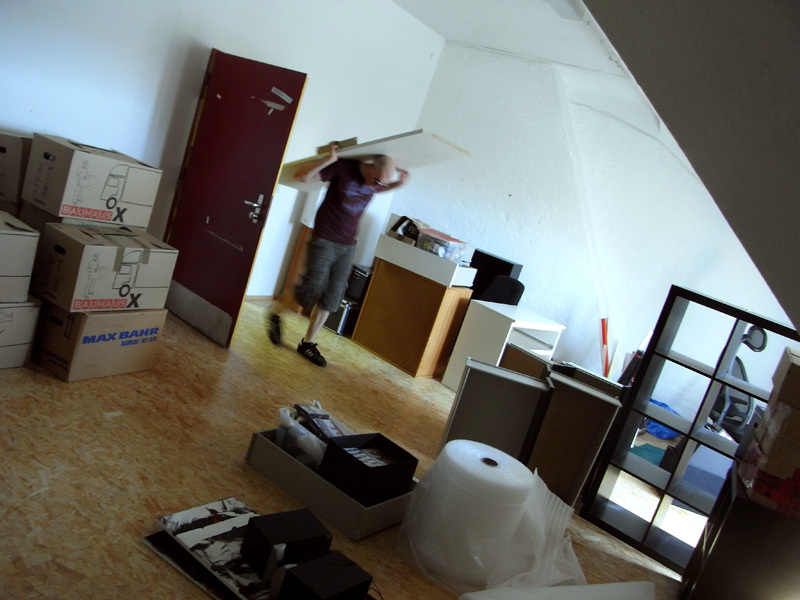 As there is a lot of things to organize at the moment, including much painting stuff, the movement to our STUDIO that will take place in early July and many emails to write the jungle bounces very slow these days. Or at least I for my part think so. Whatever my thoughts are, there are miniatures to show to you. I did finish a figure which goes back to Hamburg, to Steffen, the one and only Sockelmacher. One of many to come. Steffen will recieve little "Pocahontas", a little native indian girl that rides her best friend "Mustang" to her party on her 5th birthday. The horse is sculpted by Maurizio Bruno, called "Roustam" - you can order it directly from him! I hope Steffen will like her as I liked his figure. You got to know that he is pretty much in Wing-Tsun martial arts and so I really cherish this little reminder that the figure comes from him - very personal and I love it! Thanks to you so much Steffen! Many thanks to you, Mister!!! While I still got to show some more amazing lil' girls I want to share some words on the base of Pocahontas. I somehow planned to make an article about my way of painting, on how I started the base, but I failed by just keeping track during progress. So I got only a few shots but maybe some interesting words for you. 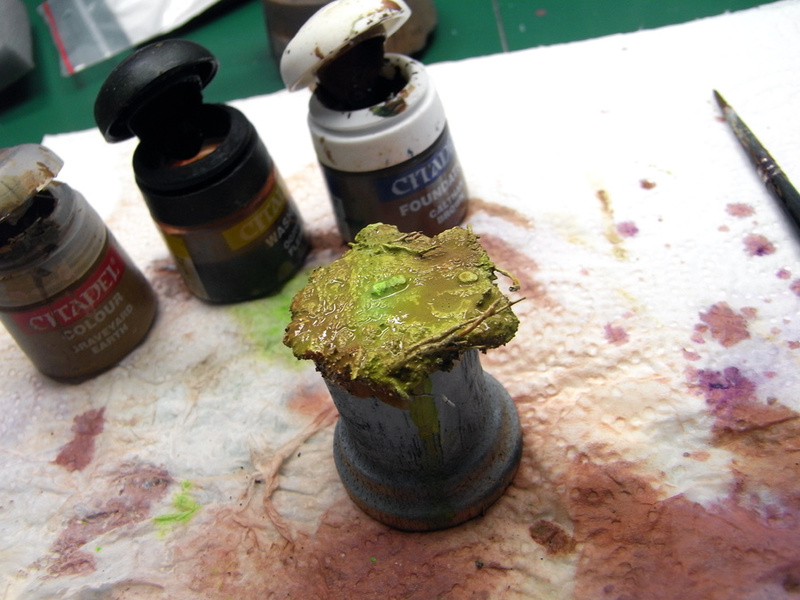 What I knew for sure was what basic colour to choose for the base. I wanted to have a springful strong colourful and natural base in the end. 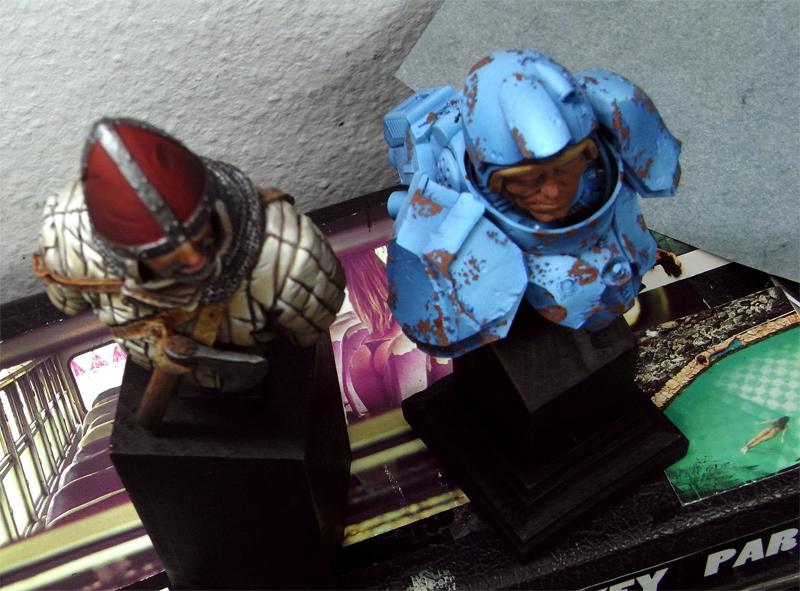 So I decided to pick a colour not that usual for painting the start. This decision came more from my stomach than from my brain but I like such decisions when it comes to happy painting. While this struck me like a lightning too I decided to pace over to bring in some desaturated colours while it was still wet. Whatever, maybe it was a good read for some of you, maybe not. In the end I can say I always felt the vibration of this powerful green during base work. Read more about this topic soon! CESAR DACOL JR sculpting sessions!